We're all familiar with Murphy's Law: anything that could go wrong, will go wrong. Prevention is a great concept, but it does not take away the need to be ready for what will go wrong. In the world of first aid and emergency care, being prepared is essential in improving outcomes. Readiness requires the right tools. 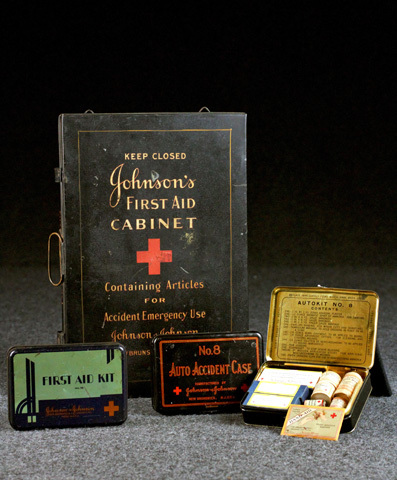 According to the medical supply company Johnson & Johnson, Robert Wood Johnson, the founder of the company, was on a train headed to Colorado for a vacation in early 1888 when he began a conversation with another passenger. This passenger happened to be the chief surgeon for the railroad and he related to Johnson the difficulty of getting injured railroad workers quickly to medical help. 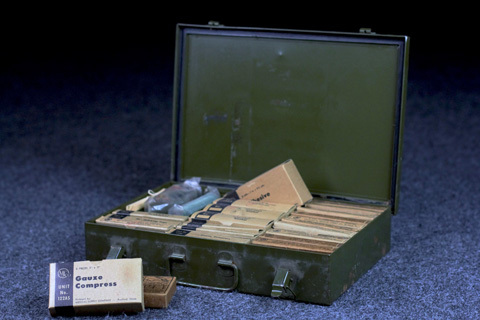 As a result of this conversation, Johnson quickly conceived the idea of packaging sterile gauzes, bandages, and dressings in protective metal boxes that could be stored much closer to where the injuries were occurring. Injuries could be treated and stabilized immediately, prior to reaching more comprehensive care. 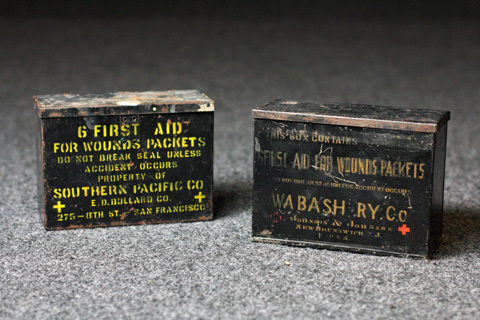 Railroad first aid kits, c. 1890 - c. 1910. Many early kits came with visual flair including dynamic colors, designs, and printing. 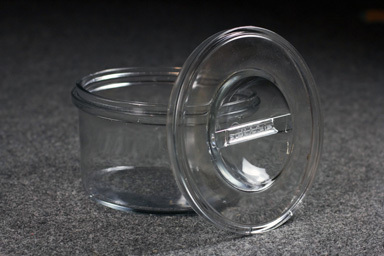 Other kits had unique design features to address certain circumstances or to create competitive advantages. designed for cleanliness and visibility, c. 1917. Aluminum tube kit designed by Standard Oil Co., c. 1924. With the modernization of packaging came an alternative to the traditional loose packaging of materials…unit packaging in small cardboard boxes of consistent size. 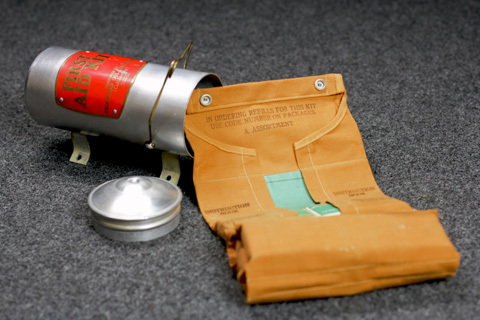 Bell Telephone Co. disaster kit with unit packaging, c. 1955. 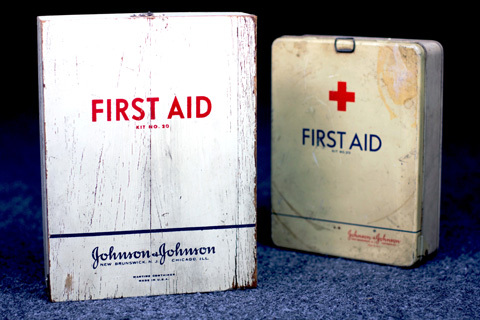 Kits today are a lot less formal and more generic, but Robert Wood Johnson’s concept of first aid supplies that are clean, protected, and nearby remains the same. Hope you enjoyed this journey through time.